RSA vs Pak 1st T20 of Pakistan tour of South Africa 2018-19 has been played in Newlands, Cape Town on 1sr Feb 2019. Get live cricket score and a highlight to know the performances of both the teams in South Africa vs Pakistan 1st T20 2019. There are so many crickets series have been played in this season. Such as India tour of New Zealand, Sri Lanka tour of Australia, Pakistan tour of South Africa and England tour of West Indies 2019. All the teams are preparing them for Cricket World Cup 2019. Get cricket news and live score of all the matches of all the series in this blog. Pakistan lost the ODI series against South Africa. So will try with full effort to win this T20 series. Faf du Plessis and Reeza Hendricks played a great role for South Africa. Faf du Plessis scored 78 off 45 delivery with the help of 6 boundaries and 4 sixes. While Reeza Hendricks played an inning of 74 runs. 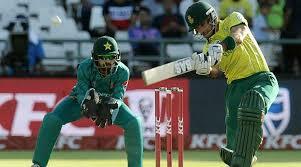 South Africa scored 192/6 in this 1st T20 SA vs Pak cricket match. Usman Sinwari got 3 wickets for Pakistan. Pakistan lost the 1st wicket the wicket of Fakhar Zaman when the score was only 4 runs. But thereafter Babar Azam and Hussain established Pakistan's inning well. Pakistan struggling to get the 1st win in this Pakistan tour of South Africa 2018-19 T20 series. Pakistan could score 186/9 and SA won the match by 6 runs.